Each H. Upmann Reserve Maduro premium cigar is created by highly skilled cigar rollers call Torcedos. Only created one at a time, these hand-rolled premium cigars are made with a rich, aged blend of Nicaraguan and Honduran long-filler tobaccos, a spicy Nicaraguan binder, and a dark, luxurious San Andrés Morrón wrapper. Once you light one up, smooth creamy flavors of sweet hints of cocoa and coffee will hit your taste buds. Sound delicious! 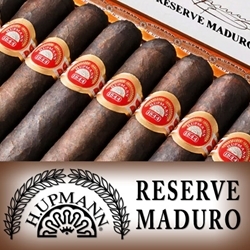 If you looking for a great dark premium cigar at a great price, the H. Upmann Reserve Maduro’s can be delivered right to your doorstep. Smokers Discounts has made it easy and affordable to buy premium cigars online. A variety of sizes and flavors are listed below. Each of these styles are in stock and available. Call us for more details!